This is an advertisement for Mrs Leech's dressmaking business. Middle and upper class women usually had their clothing made for them at a dressmakers. 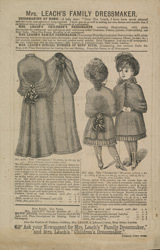 They would choose material from the dressmaker’s stock and buy their own trimmings and accessories to match, giving them to the dressmaker to incorporate into the dresses. It was not until the 1860s that the sewing machine was used commercially on a large scale so before this time all the clothing would have been hand stitched. Female employees worked long hours, often in small workshops, with little light or ventilation for very low wages.